Sitting at the foot of the north-west Himalayas, Radisson Hotel enjoys beautiful views of the surrounding cedar forests and mountains. Offering free Wi-Fi, it also has a seasonal outdoor pool, pampering spa treatments and a gym. Fitted with both air conditioning and heating, the large rooms are equipped with a flat-screen TV and a minibar. A personal safe and tea/coffee making facilities are included. Bathrooms have shower facilities. Radisson Hotel is less than 200 metres from Jakhu Temple and The Mall. 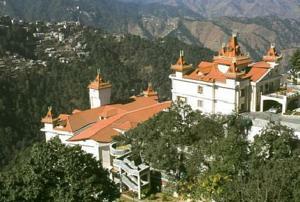 It is 1.3 km from Himachal State Museum. Shimla Airport is 26 km away. Free parking is available. Day trips and car rentals can be arranged at the tour desk. The hotel also provides a business centre and laundry services. The front desk operates 24 hours. Opening out to a garden, Cafe Valley Vue serves international cuisine. Drinks can be enjoyed at Pulse Terrasse Bar. Rooms: Hotel Rooms: 59, Hotel Chain: Radisson. Free! One child under 5 years stays free of charge when using existing beds. One further older child or adult is charged INR 1750 per person per night in an extra bed. Maximum capacity of extra beds in a room is 1. There is baby beds in a room is 0 capacity for cots in the room. Any type of extra bed or crib is upon request and needs to be confirmed by the hotel. Supplements will not be calculated automatically in the total costs and have to be paid separately in the hotel.